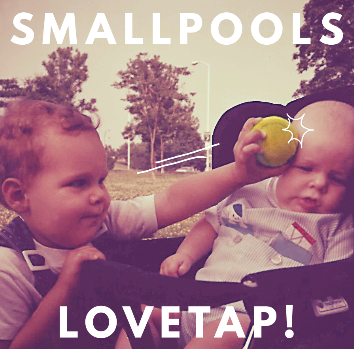 Smallpool’s Melodic LOVETAP! – 2015 Album of the Year Finalist … Already? Fans of Los Angeles-based quartet Smallpools could have told you two years ago – after the band’s debut self-titled EP – that its first album would immediately become an Indie Alt/Rock finalist for Album of the Year whenever it dropped. Smallpool’s effervescent electricity shoots through its songs like a electric charge to water, and the result is musical lightning buzzing through your veins with an ecstatic, toe-tapping vibe. Now, almost a month away from LOVETAP!, Smallpool’s debut release set to be dropped by RCA records on March 24, I cannot hold myself back any longer with the effusive praise. Smallpools has East Coast roots; Mike Kamerman (NJ) and Sean Scanlon (NY) flew away from the cold weather to sunny L.A. to pursue music, and there they met Joe Intile and Beau Kuther, who together combined to form Smallpools. May of 2013 saw the release of the band’s first single – “Dreaming” – track 3 on the album – and “Dreaming” quickly reached #1 on the Hype Machine and #23 on Billboard’s Alternative Songs chart. The band shot out an EP in July of that year and found even more success, having songs featured on FIFA and by Snapchat. The success found tours, and the band has supported Indie staples like San Cisco, WALK THE MOON, and Neon Trees. It’s about time that Smallpools is the main act. So, what will you hear on the album. Check out this track (above) entitled “Karaoke.” This, the first single off the album (released in November of last year), is an ebullient track with stuttered synth, 80’s-like keys, and energized vocal harmonies. It is beyond just superficial pop; there is true quality to Smallpool’s melodies – there is a passionate strength to this tune, and that is consistent with all of its tracks. I’m drawn to when the track is stripped down to its bare elements – a moment of vulnerability that is refreshing. “Over and Over” is my favorite track by Smallpools. It is a perfect pop song. A sub-3-minute power piece that meshes elegant synth, echoed vocals, creative percussion, and a tremendous hook. The song meshes Colony House, Grouplove, and even some Jukebox the Ghost into a killer track that is repeat-worthy. Get ready to hear a lot more of Smallpools – I’m just fine with that!